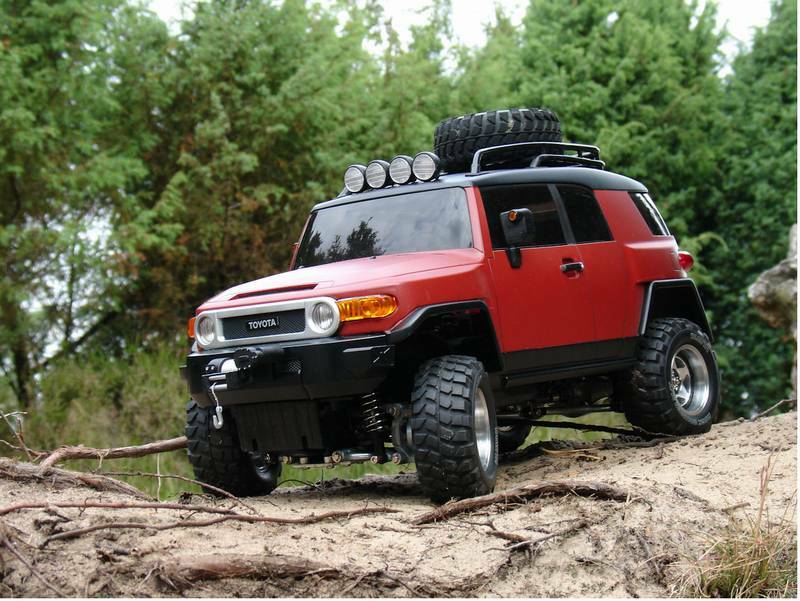 Launched as a private vehicle in North America in 2006 , to hold the deep-rooted fan is released in Japan in 2010 Toyota FJ Cruiser. It has the image of a great car Land Cruiser FJ40 that has been loved all over the world, front down cormorant oval grille and round headlights, fender it leaves paste has been reproduced the very best in polycarbonate design etc. Seen loads of FJ's on the roads in Florida when I've been over there - strange looking vehicle but supposedly quite luxurious. Don't know why but it reminds me a little bit of the Renault Avantime ! The 1:1 is going out of production soon per the automotive press. The chassis/drivetrain is the best feature of this vehicle as most of the bits are recycled from the Tacoma/Hilux. The body is a real problem. It has four doors, but the rear doors won't open unless the front doors are opened first. Also, none of the second row side windows or the rear window open; only the first row side windows open. I think the early launch price on this car was around $26k is the USA. For that price it was equipped with a V6 and 4WD, which was a relative bargain. When I first read about it I liked the chassis and drive train, but the halfway body styling and real world usability made it a no-go for me. Personally I think this vehicle is quite ugly and fell short of its potential. If it had more Jeep styling like the original FJ40 and more utility, I might have bought at the early price. This was a weak attempt by Toyota to cash in on some of the retro styling craze seen in other vehicles like the PT Cruiser, Chevy SSR, and Mustang/Camaro/Charger/Challenger. Wow this is awesome news! I've wanted an FJ body for my CC-01 since I first got it. But all of the toy-grade options are out of production and the ones still available are way overpriced. I hope it's a hard body, but I'm guessing it will be Lexan. Either way, it's awesome news. Where I come from, every man and his dog has a 4WD and so does his little sister. The FJ is pretty popular here becuase it really performs, it's not over priced and it is really practical for fishing, camping, surfing etc. I don't mind the Plastic Prado but I heard the styling was based on the head shape of a Staffie / Pit Bull. Is it just me...the 1/10 version looks much better than the 1/1...maybe is those big chunky tires. For looks, the jeep wins handsdown, but for reliabilty...you know the answer. Quite a few 1:1 FJ Cruisers here on the roads in Australia too. I must admit, when i first layed eyes on the orange one it almost caused me to crash, hideous. I don't mind them now I gotten used to them. I've seen a blue one in the UK, assume it must have been an import. I pointed it out to the Mrs but she wasn't particularly interested! I like them; they're kinda funky. What we (or I, but I'm assuming the feeling is pretty mutual) really want is a decent hardbody alternative to the Pajero which is so old now. They still look good and they keep re-releasing them, so they (Tamiya) must realise what their customers are wanting? Instead we get another Lexan bubble with Toyota badges, not exactly exciting is it?! I can't say I like the looks of it, and I won't be adding one to my collection, but I am very pleased to see Tamiya bringing out more shells for the CC01 chassis. Perhaps they will bring out something more desirable next time? & others have already made hard bodies of suitable size. Stock it looks undertyred but with a decent lift & some larger 3X" rubber it's menacingly imposing in traffic. have made suitable unscale adjustments to look better small. I actually do prefer this version to the original FJ (sorry), on a positive note it is great to see Tamiya bring out new vehicles that fans have been looking for. Even in Lexan it will still have some great details I am sure. Still though,i'm glad to see a modern bodied CC01 with accurate suspension. i.e. IFS on the FJ40, Bronco, etc. These are huge in the Middle East, there are a lot of people driving them here because they are fairly well priced, the service and spares network is big and also because the Toy-mota reliability is prevalent. I personally am not to fond of them because of the door setup, the first versions had this really corny, false, plastic checker-plate surfaces on the interior and also because they have a really bad, large blindspot on on them. This was cured somewhat in the new, upper-spec versions that came with a reverse camera. The upper-spec also comes with a rear diff-locker which makes them very capable in the sand. This in itself is a drawcard especially in a manual version. They will go where you want them to in a soft sand environment, particularly if you have the right tyre combo. 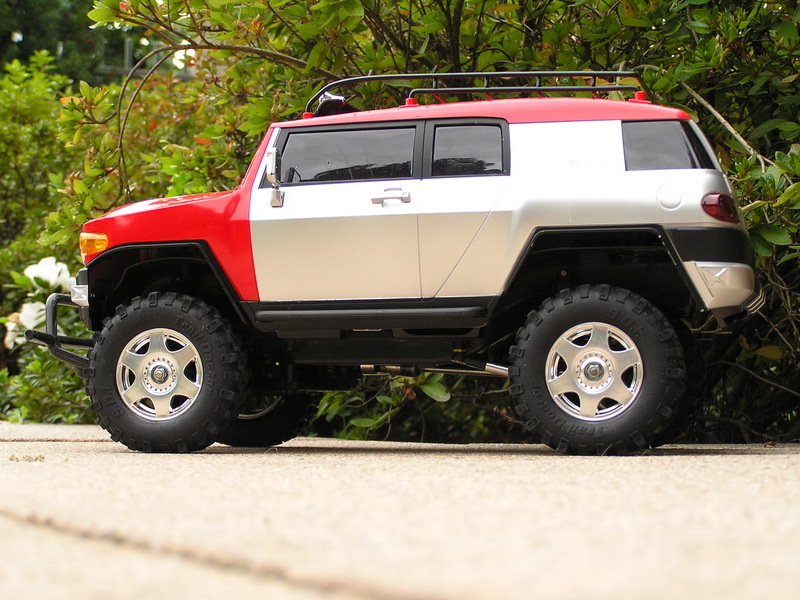 Tamiyablog has pictures from the fair showing the FJ Cruiser. Is it lexan or hardbody, anyone?